1. Carbide and roller blade guides . 2. Automatic head elevation control. 3. Power-driven blade cleaning brush. 4. Hydraulic quick-setting vise . 5. Coolant cleaning flush hose . 6. Quick adjusting carbide saw guide . 7. pressure compensation feed-rate control. 8. 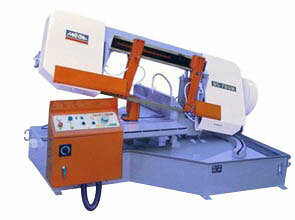 Motorized turn table mitre cutting device.